Meal Notes: This easy, satisfying Italian side-dish is a great way to liven up almost any main dish, but I think it goes particularly well with simple chicken recipes, like Chicken with Lemon and Garlic . Prep: Preheat oven to 400 degrees. Peel potatoes and cut into bite-size slices. Dice onion and tomatoes. Line a baking dish with aluminum foil for easier clean-up. 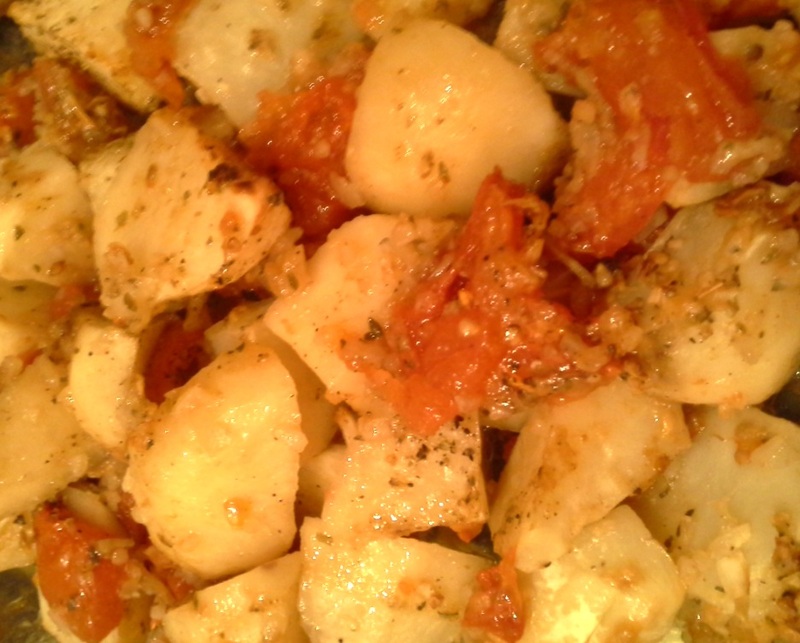 Mix: Add the potatoes in a large bowl with onion, tomato, cheese, oregano, salt, pepper, and water. Toss to combine. Bake: Coat the bottom of prepared baking dish with 1 Tablespoon of the olive oil. Dump the contents of the bowl into the baking dish, then pour the remaining olive oil on top. Place the baking dish in the oven and bake for about 1 hour, turning the potatoes every 20 minutes or so until they are tender when prodded with a fork. Remove from oven and cool for about 10 minutes before serving.